A man who allegedly stole a car with a baby inside has been captured on camera handing over the infant to a store clerk at a Royal Palm Beach gas station in Florida on Tuesday, March 20, according to local reports. 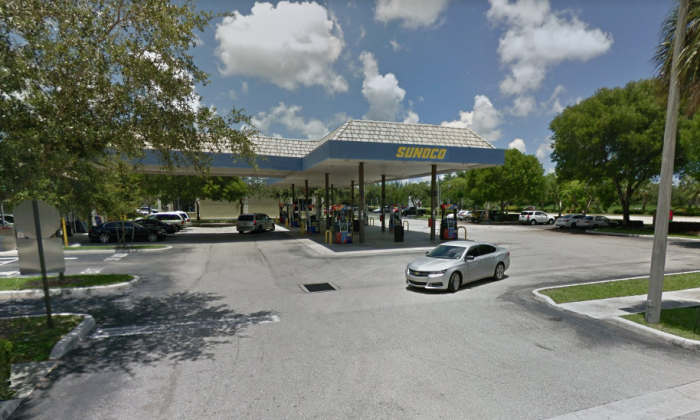 The shocking moment was caught on CCTV showing the suspect wearing a white tank top and dark pants when pulling up to a Sunoco gas station just south of Okeechobee Boulevard on State Road 7. He was then seen running up to the front of the store with the baby in the car seat, reported Palm Beach Post. Michelle Ashby, co-owner of Jack’s Place restaurant inside the Sunoco gas station, told the newspaper that the man knocked on the door and tried to get the attention of the overnight clerk. “Take the baby! Take the baby!” the man allegedly said. Ashby said the man appeared to be scared and in a hurry when he knocked on the gas station’s door. Earlier on Tuesday, the suspect allegedly stole a black Kia Rio at around 4 a.m., which was left unattended with its engine running from a gas station at Wallis and Haverhill roads, police said. A five-and-a-half-month-old baby was still in the car. The suspect then drove 6 miles from where the vehicle was allegedly stolen and handed the baby to the clerk at the gas station, reported the newspaper. Ashby said the baby was asleep in its carrier when police and the infant’s mother were notified. “It all happened so fast,” she told the newspaper. The mother arrived about 30 minutes later, and was happy and relieved to be with her baby. Police said they tracked the car to Sansbury’s Way and Okeechobee, but the man was gone. The man was still at large as of Tuesday afternoon, reported Palm Beach Post.